"Thank you for this new journey," Kikuchi said. 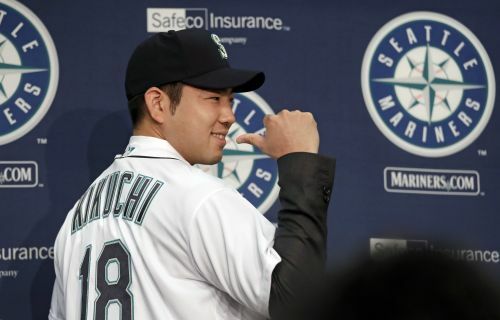 The prized Japanese left-hander was introduced as the newest member of the Seattle Mariners on Thursday, a day after signing a four-year deal with options that could make it a seven-year stay in the Pacific Northwest. The 27-year-old Kikuchi spent more than 40 minutes answering questions about why he wanted to come to the majors and why he chose Seattle. Kikuchi answered the vast majority of the questions from English-speaking reporters in English. His answers were brief, but it was a sign of how long he's wanted to play in the majors. The dream started when he was 15, and Kikuchi knew if he was going to realize it, English would be an asset. A fastball ticking into the mid-90s helps, too. "I want to practice hard and adjust myself. I want to enjoy every single thing," Kikuchi said. Kikuchi also has an array of offspeed pitchers, part of his resume as one of the top young pitchers in Japan. Kikuchi was posted by the Pacific League's Seibu Lions on Dec. 4. Under the rules in the November 2017 posting agreement, he had until Wednesday afternoon Seattle time to sign with a major league team. Seattle is planning to limit Kikuchi's innings while keeping him on the regular rotation of starting every fifth or sixth day. To make that happen, general manager Jerry Dipoto said there may be times Kikuchi goes through his normal routine but only throws one or two innings. The Mariners might use that plan for a few of their young pitchers over the next few seasons. Kikuchi and agent Scott Boras are on board. "I really felt with a player of this ability that we had the opportunity to restructure a new format to how we're going to acclimate them to this environment," Boras said. "Jerry being a former pitcher, I raised this, we talked about the data that I had assimilated and talked about, let's do something that is going to help you long term and help the player become something that is more what we do with our youth here." Kikuchi's deal is unusual in its structure, but falls in line with Seattle's approach to its new lefty. The deal is worth $56 million guaranteed over four years, but could be worth up to $109 million over seven seasons if options are exercised. He receives a $6 million signing bonus and salaries of $8 million this year, $14 million in 2020 and $15 million in 2021. The agreement includes a $13 million player option for 2022, and Seattle has options worth $16.5 million annually for 2022-25. On the surface it appears to be a winning combination for the player and the team. Kikuchi gets to acclimate to the majors without the pressure of being thrust onto a pitching staff that needs him to carry big innings and be a major contributor from the start. Seattle gets a lower upfront cost for a possible major return if Kikuchi develops into a frontline starter. And the structure of the deal allows for potential opt-outs at three and four years if the sides believe the relationship isn't working, but provides the opportunity for Seattle to lock up Kikuchi through 2025 during a stretch the Mariners hope to again be contenders. Boras said there were teams interested in Kikuchi that would have put him right into the heart of their rotations with the expectations of throwing 170 or more innings in 2019. That won't be the case in Seattle. "It was more about where Yusei ends up than where he begins," Dipoto said. "We know we're getting very talented young players who is focused and high character. This is about step one in a development that will allow him to achieve his upside as a major league player, and we think it's considerable."